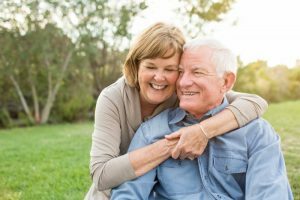 Full and partial dentures are only meant to rest on top of the gums, meaning that most of the issues associated with tooth loss are not being properly addressed. Dentures work to replace some functions, but those functions (i.e. chewing) never really feel the same. For example, patients with dentures typically have more difficulty tasting the foods they like or preventing them from shifting while in use. This creates the opportunity for many awkward situations at the dinner table. Additionally, dentures can’t guarantee a long-term solution for patients seeking tooth replacement. Even though dentures are durable enough to last at least a decade, they often don’t get that much use because the patient’s mouth is always changing shape. When teeth are missing, blood stops flowing to the facial tissues, which causes these changes. This forces the patient to replace their denture entirely after 5 to 7 years, and that’s with multiple relinings from your dentist. When we talk about implants, we’re essentially talking about a titanium post that’s meant to replace your tooth root. The tooth root is responsible for stimulating bone inside the jaw, blood flow, and holding teeth in place. By addressing this key part of the missing tooth, you get the closest option to having your natural tooth replaced. Since implants are fixed prosthetics, there’s no additional maintenance to keep them intact or functioning. By simply brushing twice a day, flossing daily, and visiting your dentist every six months, you can easily make your implants last anywhere from 30 years to a lifetime! You’ll start off by having a consultation with your dentist in Lacey. This will help you determine if your gums are healthy, if your natural bone has enough volume to hold implants, and the number of implants you’d like to have placed. If eligible, you’ll schedule a visit to have the implants placed, then start your healing period. This period lasts around 3 to 6 months and allows the implant to properly adhere to your jawbone through a process called osseointegration. Once the bone and surrounding tissue has healed, you’ll come back to have a customized restoration placed on top. Have more questions on the dental implant process? Schedule an appointment today! Dr. Venn R. Peterson earned his DDS degree from the University of Washington School of Dentistry. He’s accompanied by Dr. Spenser Cammack, who earned his DDS degree from The Ohio State University College of Dentistry. Unlike most general dentists, Dr. Peterson and Dr. Cammack are fully trained to place implants and restorations entirely in his office, making your treatment more convenient. To learn more about their practice, contact them through their website.